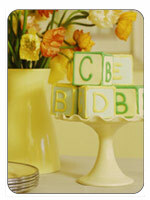 Decorating for a baby shower can be great fun, as long as you keep a few simple rules in mind. Remember that sometimes less is more and so you should strive to keep it simple. Baby shower decorating usually consists of baby shower table centerpieces, wall decorations and baby shower favors. You need to decide whether you want a baby shower theme, as your decorations will have to comply with the color scheme. Remember, as far as baby shower decoration ideas go, the sky is the limit. One popular decoration is a baby cake! No, it's not edible-it just looks like a cake. Baby shower center pieces vary greatly. They may consist of balloons, flowers, baby shower gel candles or stuffed animals. Your baby shower centerpiece can also stick to a general theme. For example, if the mother-to-be is a big fan of Winnie the Pooh, then you can search for centerpieces that either have the cartoon cast or for colors that center around a stuffed Winnie the pooh character. Another fun idea is to make an edible baby shower centerpiece and incorporate its decoration into the shower. The host should bake a cake the morning of the shower and have lots of cake decorations on hand. There are many great cake decorating ideas for showers. To decorate the centerpiece cake, you can either have guests arrive early to help decorate and make a surprise for the mother or you can use it as a bonding moment during the baby shower. Have guests write messages of support, wisdom or greetings for the baby-to-come. Whatever you do, have a camera to document the cake before it gets devoured! Talk about homemade baby shower decorations! Go to our forum for great baby shower decorating ideas.